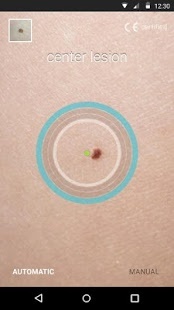 SkinVision helps you and your family with the early detection of skin cancer. 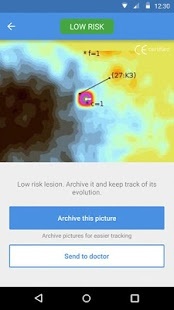 In the past 6 years, with our clinically validated algorithm, we have detected more than 27,000 cases of melanoma and other common skin cancers globally, helping ensure that thousands are able to get treatment in time. SkinVision is the first Class 1 medical device using clinically-proven technology that is trusted by insurance companies worldwide for the early detection of skin cancer. SkinVision has partnerships with leading health insurers, skin cancer clinics and research universities in Australia, Germany, the Netherlands, and New Zealand. ORCHA, the world's leading independent provider of health and care app reviews has assessed SkinVision as Level 4 Regulated with a score of 89%, the highest of any skin cancer app. This score is calculated on data security, clinical assurance and user experience. WHY SKINVISION? Monitoring skin spots for suspicious changes can help you detect skin cancer at an early stage- when it’s most treatable. By using SkinVision, you: Check for signs of skin cancer from the comfort of your home, helping to avoidavoiding unnecessary doctor visits. Receive an instant risk indication of your skin spot and personal Doctor’s Advice. Store your photos in your archive to track skin changes over time or to share them with your doctor. Contribute to SkinVision’s mission in saving 250,000 lives in the next decade. Checking your skin for skin cancer has never been easier: sign up for SkinVision today and take your skin health into your own hands. BENEFITS OF SKINVISION For only GBP 21.99 / EUR 24.99 you can do unlimited Smart Checks for an entire year and have access to our dermatologists. If you prefer to do a single skin check, it is also possible for GBP 3.99 / EUR 4.99 Your first Smart Check is on us. 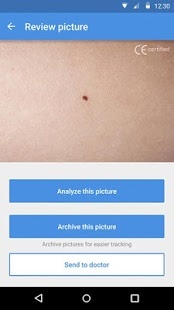 Benefits of the Smart Check: Take photos of skin spots with the automatic camera and receive a risk indication (low, medium, or high) within 30 seconds. All photos with a risk indication are quality checked by our team of dermatologists and image recognition experts. In the case you receive a high-risk indication and our dermatologists see a reason to visit a doctor, we will contact you within two working days with advice on next steps to take. With the SkinHealth Program (1 year): Unlimited Smart Checks for an entire year. Ideal for if you have more than 5 moles or want to check your skin on a regular basis. 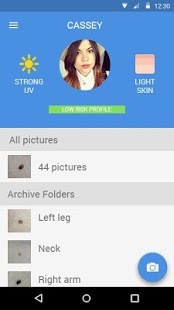 ADDITIONAL FEATURES Personalised advice based on your skin type and risk profile. Local UV index with related skin advice. Reminders via email, SMS and/or push to help you regularly check your skin. CONNECT WITH SKINVISION Website - https://www.skinvision.com Facebook - https://www.facebook.com/sknvsn Twitter - https://twitter.com/sknvsn Do you have any questions or feedback? We would love to hear from you. Contact us at info@skinvision.com. DISCLAIMER: SkinVision helps detect irregular patterns which occur in the most common forms of skin cancer. Our results do not form a diagnosis and should not be treated as such. Our dermatologists provide advice on the next steps to take, but do not offer a diagnosis. Therefore, if at any moment you feel uncomfortable about a skin lesion, we advise you to visit a doctor. The App doesn't provide support for users with poor sight. The App doesn't provide support for users with hearing difficulties.